Moving is never an easy step, and it is especially difficult when you don’t have the right tools to help you make the process easier. However, we’ve been able to help you put together a set of packages that can help you with what you need. Prices for each package vary, but you will definitely be able to get a package that meets your needs effectively. The Basic Moving Boxes Kit: With this, you get 9 Small Moving Boxes, 9 medium Moving boxes, 110 yards of packing tape, 1 clamshell tape dispenser, 24' of bubble roll, 3 lbs. of wrapping paper, and 1 Marker. The Bigger Boxes Smart Moving Kit: Choose this option and you’ll get 11 Medium moving boxes, 3 large moving boxes, 4 rolls of Smart Move Tape, 1 heavy-duty dispenser,3 lbs. of wrapping paper, and 1 marker. Basic Moving Boxes Kit: 18 small moving boxes, 18 medium moving boxes, 110 yards of Packing Tape, 1 Clamshell tape dispenser, 48' of bubble cushioning rolls, 6 lbs. of wrapping paper, and 2 markers. Bigger Boxes Smart Moving Kit 2: This package offers 2 medium moving boxes, 6 large moving boxes, 6 rolls of Smart Move Tape, 1 heavy-duty dispenser, 110 yards of packing tape, 24' roll of bubble roll, 3 lbs. of wrapping paper, and 2 markers. Economy Kit 3: 10 Small moving boxes, 20 Medium moving boxes, 10 large moving boxes, 220 yards of tape, and 2 markers. Basic Moving Boxes Kit: 18 small moving boxes, 18 medium moving boxes, 9 large moving boxes, 110 yards’ tape & 1 Clamshell, 48' of bubble cushioning roll, 6 lbs. of wrapping paper, and 2 markers. Bigger Boxes- Smart Moving Kit 3: 30 medium moving boxes, 10 large moving boxes, 6 rolls of Smart Move Tape, 110 yards of Clear Tape, 1 heavy-duty dispenser, 48' of bubble roll, 3 lbs. of wrapping paper, and 2 markers. Economy Kit 4: The economy kit under this package provides you with 10 small moving boxes, 20 medium moving boxes, 10 large moving boxes, 10 extra-large moving boxes, 220 yards of tape, and 2 markers. 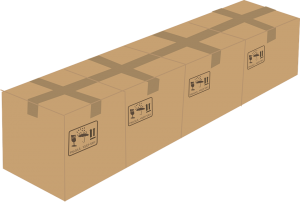 Basic Moving Boxes Kit: Under this, you get provided with 18 small moving boxes, 18 medium moving boxes, 9 large moving boxes, 10 extra-large moving boxes, 110 yards’ tape &1 Clamshell, 48' of bubble cushioning roll, 6 lbs. of wrapping paper, and 2 markers. Bigger Boxes- Smart Moving Kit 4: 30 medium moving boxes, 10 large moving boxes, 10 extra-large moving boxes, 6 rolls of Smart Move Tape, 110 yards of clear tape, 1 heavy-duty dispenser, 48' of bubble roll, 3 lbs. of wrapping paper, and 2 markers. Economy Kit 5: 10 small moving boxes, 20 medium moving boxes, 22 large moving boxes, 10 extra-large moving boxes, 220 yards of tape, and 2 markers. Basic Moving Boxes Kit 5: With this, you get 18 small moving boxes, 18 medium moving boxes, 21 large moving boxes, 10 extra-large moving boxes, 110 yards’ tape & 1 Clamshell, 48' of bubble cushion wrap, 6 lbs. of wrapping paper, and 2 markers. Bigger Boxes- Smart Moving Kit 5: This provides you with 30 medium moving boxes, 22 large moving boxes, 10 extra-large moving boxes, 6 rolls of Smart Move Tape, 110 yards of clear packing tape, 1 heavy-duty dispenser, 48' roll bubble cushioning wrap, 3 lbs. of wrapping paper, and 2 markers. Economy Kit 6: 15 small moving boxes, 30 medium moving boxes, 22 large moving boxes, 10 extra-large moving boxes, 330 yards of tape, and 3 markers. Basic Moving Boxes Kit: Materials provided under this kit includes 7 small moving boxes, 27 medium moving boxes, 21 large moving boxes, 10 extra-large moving boxes, 220 yards’ tape & 2 Clamshells, 72' roll bubble roll, 9 lbs. of wrapping paper, and 3 markers. 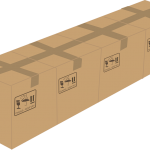 Bigger Boxes- Smart Movers Kit: With this, you get 41 medium moving boxes, 25 large moving boxes, 10 extra-large moving boxes, 10 rolls of Smart Move Tape, 110 yards of clear tape, 2 heavy-duty Dispensers, 48' roll of bubble roll, 6 lbs. of wrapping paper, and 3 markers. Economy Kit 7: 20 small moving boxes, 40 medium moving boxes, 22 large moving boxes, 10 extra-large moving boxes, 330 yards of tape, and 3 markers. Basic Moving Boxes Kit: 36 small moving boxes, 36 medium moving boxes, 21 large moving boxes, 10 extra-large moving boxes, 220 yards tape & 2 Clamshells, 96' of bubble roll, 12 lbs. of wrapping paper, and 4 markers. Bigger Boxes- Smart Moving Boxes Kit: 52 medium moving boxes, 28 large moving boxes, 10 extra-large moving boxes, 12 rolls of Smart Move Tape, 220 yards of clear tape, 2 heavy-duty dispensers, 72' of bubble roll, 6 lbs. of wrapping paper, and 4 markers. Take advantage of any of the following to move stuff covering a much as 8 to 9 rooms. Economy Kit: 20 small moving boxes, 40 medium moving boxes, 32 large moving boxes, 10 extra-large moving boxes, 440 yards of tape, and 4 markers. Basic Moving Boxes Kit: 36 small moving boxes, 36 medium moving boxes, 21 large moving boxes, 20 extra-large moving boxes, 220 yards’ tape & 2 Clamshells, 96' of bubble cushion, 12 lbs. of wrapping paper, and 4 markers. Bigger Boxes- Smart Movers Kit: 52 medium moving boxes, 28 large moving boxes, 20 extra-large moving boxes, 12 rolls of Smart Move Tape, 220 yards of clear tape, 2 heavy-duty dispensers, 72' of bubble cushioning rolls, 6 lbs. of Wrapping paper, and 4 markers. We also have options for people looking to move out of mansions with rooms between 9 and 10 in number. Economy Kit: 20 small moving boxes, 40 medium moving boxes, 32 large moving boxes, 20 extra-large moving boxes, 440 yards of tape, and 4 markers. Basic Moving Boxes Kit: 36 small moving boxes, 36 medium moving boxes, 33 large moving boxes, 20 extra-large moving boxes, 220 yards’ tape & 2 Clamshells, 96' rolls of bubble roll, 12 lbs., of wrapping paper, and 4 markers. Bigger Boxes- Smart Movers Kit: 52 medium moving boxes, 40 large moving boxes, 20 extra-large moving boxes, 12 rolls of Smart Move Tape, 220 yards of clear tape, 2 Heavy Duty Dispensers, 72' of bubble cushioning roll, 6 lbs. of wrapping paper, and 4 markers. We understand the fact that these houses rarely come to market, but we also have cheap shipping boxes for them as well. Economy Kit: 20 small moving boxes, 40 medium moving boxes, 44 large moving boxes, 20 extra-large moving boxes, 440 yards of tape, and 4 markers. Basic Moving Boxes Kit: 45 small moving boxes, 45 medium moving boxes, 33 large moving Boxes, 20 extra-large moving Boxes, 330 yards’ tape & 3 Clamshells, 120' of bubble roll, 15 lbs. of wrapping paper, and 5 markers. Bigger Boxes- Smart Movers Kit: The biggest of them all! 63 medium moving boxes, 43 large moving boxes, 20 extra-large moving boxes, 16 rolls of Smart Move Tape, 220 yards of clear tape, 3 heavy-duty dispensers, 72' roll bubble Roll, 9 lbs. of wrapping paper, and 5 markers.